The Executive President of Road Transport Employers Association of Nigeria, Comrade Osakpamwan Eriyo and Independent National Electoral Commission has signed a Memorandum of Understanding for the movement of logistics on the forthcoming General Election. Smith Sylvester, Political Adviser to the INEC National Chairman,Professor Mamood Yakubu represented at the official signing of the MOU at the National Headquarters of RTEAN, 4B Arusha crescent, zone one Wiuse, Abuja. 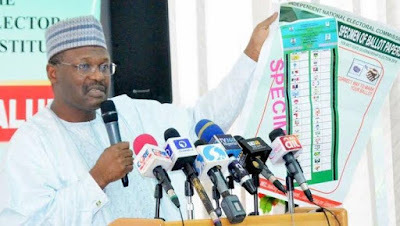 The INEC chairman who spoke through Smith said the signing of the MOU is important to the commission for the movement of their logistics because they INEC can not afford to fail Nigerians. He said INEC have full trust in RTEAN as employers of labour in providing the much needed vehicles for the logistics in the forthcoming election. Responding, the Executive President of RTEAN, Comrade Osakpamwan Eriyo thank INEC and promised to delivered to the benefit of Nigerians and the commission. Osakpamwan Eriyo said base on the MOU entered into, his leadership has purchased three hundred Buses and hundred Hilux that will be distributed to it state branches across the country. He also debunked any faction in the Union saying that, "both myself, my Executives and the former President, Musa Isiwele are working in one accord, no rift between us at all." Professor Mahmood Yakubu will officially and personally meet with the Comrade Osakpamwan Eriyo leadership of Road Transport Employers Association of Nigeria today Friday, 18th January, 2019 at the INEC headquarters in Abuja.